The Dogs won the inside 50 count 6147 and had 28 shots at goal to 24, but lost on the scoreboard by two points. Not unlike their elimination final loss to the Crows, they conceded 13 scoring shots, including eight goals, from the defensive half. Tom Langdon has won a gamehigh eight intercept possessions. Both teams have scored 69 points from intercepts. The Hawks led the league in 2015 with 67 points per game from this source. The Pies have now launched 40 points from the defensive midfield, 18 more than they scored per game in 2015. Tom Boyd has grabbed a gamehigh five marks in the forward 50. His career-high is four. Jarrod Witts has won five hitoutsto-advantage with his fifth launching his team's sixth goal from clearances. Tom Boyd is the only other player on the field to win a hitout-to-advantage. He was won one. The Pies have won the last six clearances of the game, including all five this quarter, but have failed to generate a score from any of these. Make that 24 points for the Dogs from intercepts in the attacking midfield. The Dogs have scored 18 points from intercepts in the attacking midfield. They scored 22 points per game from this source in 2015, the fourthmost in the AFL. The Dogs conceded 17 points per game from the defensive midfield in 2015, the seventhfewest of all teams. They conceded 21 points from this zone in the third quarter. The Pies won the ball at the contest in the third quarter. They won the clearance count 113 and booted five goals to none from this source, and they won the contested possession count 39-25. Corey Gault is up to six disposals, four contested possessions and three score involvements this quarter as well as kicking two goals. The Pies lead the inside 50 count 158 this quarter, and Darcy Moore has grabbed three marks in the forward 50. The last two goals for the Dogs have been sourced from intercepts in the forward 50. They have scored 38 points from this source. The AFL average was eight points per game in 2015. 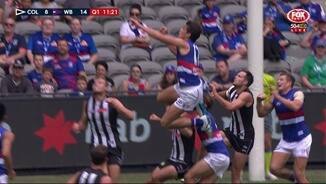 That clearance to Mitch Wallis ending a run of eight consecutive clearances for the Pies. Make that six clearances in a row for the Pies with four of these launching scores. Taylor Adams has won three of these will all three launching scores for his team. The Pies have won the last five clearances and generated three scores from these. Taylor Adams has won two of these clearances with both launching scores. The Pies have scored 21 points from chains originating in the defensive half this quarter. They scored just 16 points from this zone in the first half. The Pies lead the clearance count 1110 since quarter-time and they have booted two goals to one from this source during this period. The Pies have won two intercept possessions in the defensive 50 this quarter with the second launching their second goal for the game from 20 intercepts in this zone. The Dogs dominated field position in the second quarter. They won the inside 50 count 199 and outscored the Pies by 15 points. Luke Dahlhaus led all players with 10 disposals, six contested possessions, three clearances and two score assists. Caleb Daniel has won an equal teamhigh three intercept possessions with all three launching goals for his team. The Pies lead the clearance count 96 this quarter, with the last clearance, won by Brent Macaffer, launching the Pies' first goal of the game from this source. The Pies have recorded just three forward 50 entries from 14 chains originating in the defensive half this quarter and they have generated a score from two of these. The Dogs have now grabbed 10 marks in the forward 50, one short of what they grabbed per game in 2015. The Pies have grabbed just three marks in the forward 50. They grabbed 13 per game in this zone in 2015, the equal fifthmost of all teams. Western Bulldogs InterchangeTom Campbell off due to an injury. That was first score for the Dogs launched from the defensive half. 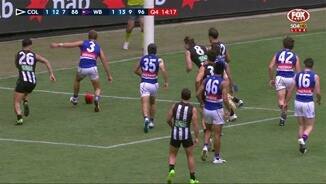 The Pies have launched four scores from this zone. Caleb Daniel has won just three disposals but two of them have launched goals for his team, a teamhigh. The Dogs won the ball at the contest in the first quarter. They won the clearance count 125 and booted three goals to none from this source. Alex Fasolo has had a bigger scoreboard impact than any other player during the NAB Challenge. With that goal it is up to 80 points, three more than the Crows' Tom Lynch. The Dogs have scored 34 points from chains originating in the forward 50. They scored 22 points per game from this zone in 2015, the thirdmost of all teams. The Dogs lead the centre bounce clearance count 51, and they have generated a forward 50 entry from each of these clearances, with the last launching the first goal of the game from this source. Lin Jong fumbles a mark at one end and Adam Treloar boots a goal at the other. The Pies entire score has come from intercepts. The Dogs have recorded that last nine forward 50 entries and they have generated five scoring shots from these. The Dogs have booted all three of their goals from intercepts in the forward 50. They scored 11 points per game from this source in 2015, the thirdmost of all teams. The Dogs have already grabbed four marks in the forward 50. They averaged 11 per game in 2015, ranked 12th. Lachie Hunter boots the Dogs' first goal, from a turnover in the forward 50. The Dogs have scored 4 points per game from this source in the NAB Challenge, ranked 18th. Travis Varcoe boots the opening goal of the game, from a turnover in the forward 50. The Pies have scored 17 points per game from this source in the NAB Challenge, ranked No. 1. The Dogs have recorded just two effective kicks. The Pies have recorded nine. Tom Langdon wins the first intercept possession of the game. Tom Langdon has won 276 intercept possessions since round 1 2014, the eighthmost in the AFL and 71 more than any other teammate. Lachie Hunter enjoyed a breakout performance in that game against the Pies. He finished it with careerhighs for disposals (32), marks (10), score involvements (10) and intercept possessions (seven). When the Dogs last played the Pies, in R17 last season, they recorded 452 disposals, which was their highest tally in a game since round 17 in 2010. Welcome to Etihad Stadium for the Collingwood v Western Bulldogs Round 4 clash. COLLINGWOOD'S boom recruit Adam Treloar has reinforced his enormous value with a best-afield performance in his first pre-season hitout. Teammate Darcy Moore bagged four goals as the Magpies remained undefeated in the NAB Challenge, courtesy of a two-point win over the Western Bulldogs at Etihad Stadium on Saturday. 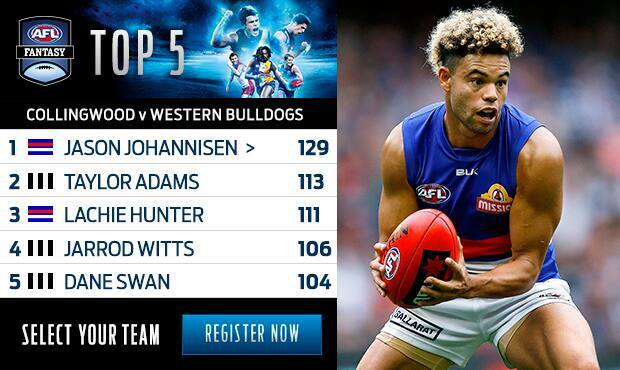 In a remarkable contest for a pre-season match, the Dogs – powered by dominant 33-disposal display from dashing defender Jason Johannisen and a three-goal effort from young key forward Tom Boyd – played the frenetic football that made them one of last season's bolters, leading by 40 points midway through the second term. But the complexion of the game changed after half-time when the seemingly undercooked Pies upped their rotations, piling on seven successive goals to storm to an eight-point lead just 17 minutes into the third term. Bulldogs sharpshooter Jake Stringer missed a flying shot in the dying moments as the Pies won 1.15.8 (107) to 1.14.12 (105). Ex-Giant Treloar, whose only official match practice had been three quarters in the VFL last week, showed no sign of any lingering groin problems, amassing 26 disposals and two goals. After starting on the bench, Treloar was soon showing his class and work ethic, often starting a chain of handballs and getting on the end of it 60m downfield, as he did when he nailed a lovely running shot after 21 minutes. Treloar later slotted a goal from outside the arc, and combined well with skipper Scott Pendlebury, Steele Sidebottom, Dane Swan and former Giants teammate Taylor Adams. Magpies coach Nathan Buckley was not surprised by Treloar's performance. "He's put a lot of work in and he's in good shape. We couldn't be happier with his progress to this point and he's ready to attack the season," Buckley said. The Bulldogs will sweat on the fitness of ruckman Tom Campbell, who left the field in the second term with a right foot injury and didn't return, raising a possible selection dilemma for the Dogs with veteran ruckman Will Minson nursing a hamstring strain that could sideline him for round one and Jordan Roughead being left out of the clash with the Pies. 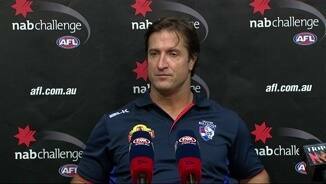 However coach Luke Beveridge was confident Campbell would be right for the season opener. "We've come out of it really healthy, besides Tom, (but) I think his ankle will be OK," he said post-match. The Dogs coach said Roughead was still very much in the selection frame, and praised Boyd's efforts, describing him as "a very, very good ruckman" and a good, developing forward who would eventually become dominant. High-priced Boyd has emerged as a possible ruck option after his impressive showing, with the talented 20-year-old contesting the first centre bounce and acquitting himself well around the ground. However, Boyd did his best work in attack, taking two superb contested marks in the first quarter, the second being a huge, floating pack mark in the goalsquare, which he converted. At the other end, fellow forward hope Moore showed he might be ready to assume the key role of second tall forward alongside spearhead Travis Cloke, who had a quiet day, kicking two easy goals from the goal line in general play. A major concern for the Pies on the eve of the premiership season was their sloppy play in the first half when they made numerous elementary skill errors, particularly in defence where a series of kicking blunders under little or no pressure provided the Dogs with scoring opportunities. 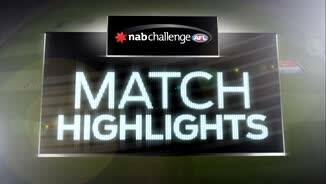 Collingwood: Good teams take advantage of basic skill errors, and the Pies had too many fumbles and missed kicks when under little pressure in the first half. In the third quarter their midfield got on top and the Magpies fought back, showing Collingwood can match it with the best teams in the middle. Western Bulldogs: Opposition teams have had the whole pre-season to scout the Dogs' runners off half-back, but that doesn’t mean they are easy to stop. Robert Murphy and Easton Wood were All Australians last year, and Jason Johannisen is not far off raising his game to that level. The quick ball movement they provide helps create one-on-ones in the forward line, a situation Jake Stringer relishes. Collingwood: Adam Treloar was involved in a scoring chain starting from half-back in the first quarter, finishing the play with a goal. Another burst through the middle in the third quarter saw Treloar kick perfectly to Darcy Moore while running flat out. Moore didn't convert but that combination should excite Collingwood fans. James Aish only came on in the last quarter, and didn't do much in the time he spent on a wing. Western Bulldogs: Matthew Suckling showed how dangerous his kicking can be around goal in the first quarter, kicking a nine-pointer from 55m out on the wrong side for a left footer. Mature-age recruit Marcus Adams spent a lot of time on Travis Cloke, with Cloke only kicking two goals. The home and away season beckons. 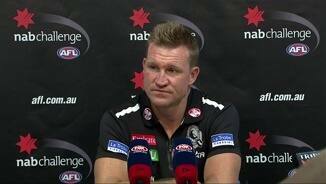 Collingwood will play the Sydney Swans at the SCG on Saturday, March 26. The Western Bulldogs go up against last year's minor premier, Fremantle, at Etihad Stadium on Sunday, March 27.